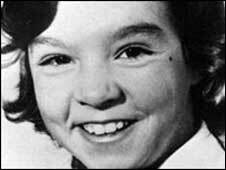 Police have confirmed that there is insufficient evidence to prosecute a man arrested over the disappearance of Genette Tate in 1978. The 13-year-old schoolgirl vanished while on a newspaper round in Aylesbeare, Devon. Police submitted a file to the Crown Prosecution Service after arresting and interviewing child killer Robert Black regarding the case in 2005. It remains Britain's longest-running missing persons' inquiry. It is almost 30 years to the day since Genette went missing while delivering papers on the afternoon of Saturday 19 August 1978. She was last seen by two friends in Within Lane, near her home in Aylesbeare, near Exeter. Her bicycle and papers were later discovered in the road. In 2005, Robert Black was questioned by Devon and Cornwall Police while he was in serving 10 life sentences in prison in connection with Genette's disappearance. Now, after examining files on those interviews, the CPS has decided that there is not enough evidence to launch criminal proceedings against him. Devon and Cornwall Police said its investigation remained open.